Are sausages the greatest thing ever invented? Probably. That’s a pretty sweeping statement but one anyone reading this can relate to and maybe agree with to a certain degree. Sausages (the standard ones) have always been associated with Breakfast – this part of the world anyway – and I’m guilty in my own way of perpetuating this in some small way ie I don’t cook enough ‘non-breakfast’ dishes with them. Whats worse is that I have a veritable Aladdin’scave quite close to me that specialises in this type of amazing produce, so it’s an early New Year’s resolution to make Sausages more the star of the show in my cooking! I have no excuse either as I’ve recently invested in a wonderful old style sausage crank! So onto this recipe – these beauties are French, they are more accurately they are Toulouse Sausages (this is what the Rugby team live on*) and they are incredible. They are a very different proposition to the bog standard banger – think more along the lines of game sausage like Venison or Wild Boar and you’re in the same general area. These are very high in Pork content and have lovely fragrant spiced flavour – they work best browned in a pan and finished in the oven – they are also one of the stars of the famous Cassoulet! STEP1: Kick things off by getting the mash together – you can make this ahead of time and bring it back together as the sausages are cooking. Typical mash recipe – steam or boil, put through a ricer and season well with salt and white pepper and flavour up with butter and parsley. STEP2: Next get the Cassoulet side going – soften the garlic and onion in a pan then add the puree – cook out fro a minute then add the wine – reduce until almost gone then add the beans and chopped tomatoes – simmer on a really low heat for about 40 minutes. Transfer to a gratin dish or pie pot then scatter over the breadcrumbs and the cheese. STEP3: So you now have the mash done and the Cassoulet side done – they can sit until you are ready to use them. STEP4: Get a wide pan on the heat and just brown the Toulouse sausages, transfer to a pre-heated over (180c) in the pan. Also add the Cassoulet to the same oven to warm through and crisp up the cheese and breadcrumbs. STEP5: As the sausages are in the oven get the mash on again, add it to a pot lash in about 50mls milk and stir in – use a wooden spoon to mix the mash and milk together warming through as it goes. 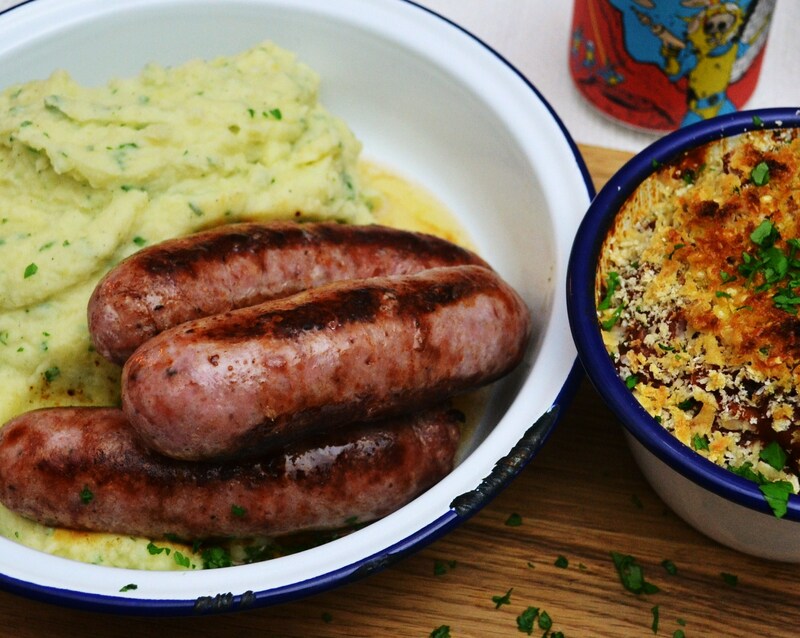 When the mash is silky and warm, stir in some parsley and serve in a dolup on your plate, pop on the sausages right out of the pan and add your Cassoulet side.